How to restore a System Image on my Windows 7 computer? I cannot boot my computer but I have the system repair disc. If your computer system is infected by a virus and not able to boot anymore, you restore the system from a system image using the system repair disc. Note that restoring your computer from a system image will erase all changes you have made on your computer after you created that system image. 1. Insert the "System Repair Disc" into the CD drive. 2. Turn on the computer and click Enter key to start booting the computer. 3. Select English and click Next, then click "Repair your computer". You may see Windows 7 showing up indicating the system name on your hard disk. 4. 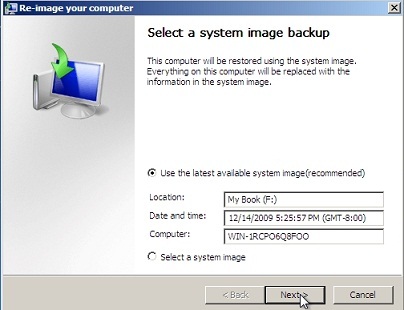 Select "Restore your computer using a system image that you created earlier" and click "Next". You will see "Re-image your computer" screen showing up. 5. Select the system image and click "Next". The computer will restore the system from the system image. Just follow its instructions.